Do you know what draws fishermen from around the country to Grand Lake every winter? 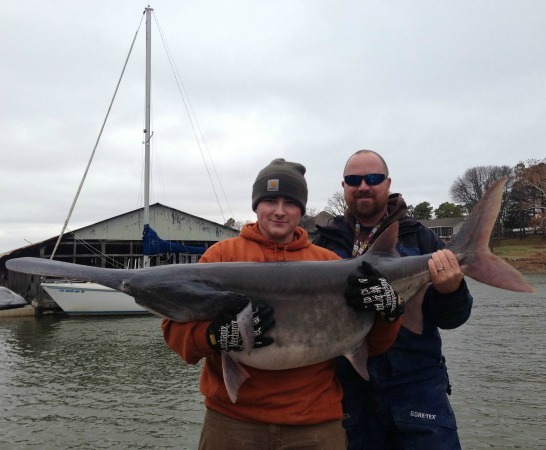 That’s right…the pre-historic paddlefish – or spoonbill as we call them around here – are the most treasured harvest of the Grand Lake area through the winter months. What makes it all so great is that the paddlefish is one of the largest freshwater fishes in North America and it’s generally accepted that the largest, most concentrated population of paddlefish in North America is right here, at good ol’ Grand Lake. Hopefully we can help you learn what you need to know to snag one of these awesome Grand Lake monster fish. To legally (is there any other way) snag paddlefish, you need a valid Oklahoma fishing license AND a paddlefish permit. You can get your license and free paddlefish permit at any area sporting goods store or Grand Lake area bait shop or online at wildlifedepartment.com or any Wildlife Department office in the state. You may only keep your one fish on Sunday, Tuesday, Wednesday, Thursday, and Saturday. Catch and release only on Monday and Friday. For complete paddlefish regulations, go HERE. The Paddlefish Research and Processing Center is located at 61091 E. 120 Road, Miami, OK, which is four miles north of Twin Bridges State Park on Hwy 137. They can be reached at (918) 542-9422. This is a seasonal facility, that is generally open each spring from the first of March until the end of April. Their hours are 9 am to 6 pm on Tuesdays, Wednesdays, Thursdays, Saturdays and Sundays. This is where you can get your paddlefish cleaned for free and be given the fillets from your fish in heat-sealed, packaged bags. The reason they do this is that the workers at the Processing Center will salvage the eggs from the female paddlefish and process the roe into a high-quality, ready-to-eat caviar, which is then sold on the international market. Yep, that’s right. Oklahoma caviar. 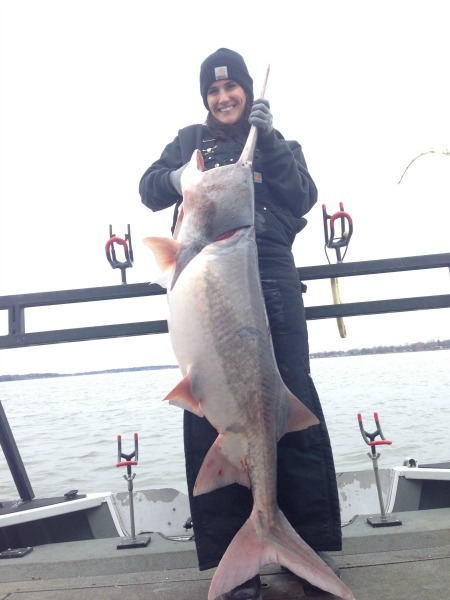 They then use the funds from the sale of the Oklahoma caviar to continue paddlefish research and management and to help develop programs that ensure the healthy paddlefish population in the Neosho watershed for years to come. It’s a win-win for everyone involved and a great program. One more thing – someone from the reasearch center will actually pick up your live paddlefish from bank and boat anglers at Grand Lake! You just need to call them at (918) 542-9422 to arrange the pick-up, then stop by the research center to pick-up your ready to go fillets. Nice! Right up front…the easiest way to snag your paddlefish is to hook up with a Grand Lake paddlefish guide. But, if you are more of a do-it-yourselfer, then here is the low-down on what you need and need to know. Keep in mind…these can be monster fish! The lake record is over 100 lbs, and 50-75 pounders are maybe not routine…but they happen! So make sure you are ready with the right tackle for your fight. This list is courtesy of the TravelOK article linked to above. Duct tape and permanent marker for tagging. If you’ve noticed, we’ve said repeatedly in this article the word ‘snag’. That’s because paddlefish are NOT going to bite even the most fancy lure or delicious live bait you throw at them. They only feed on microscopic plankton, so to land one of these monsters you need to be dragging a hook until you snag one, whether you are on the bank and reeling towards the bank or out in a boat trolling. Another thing to keep in mind if you will be bank fishing, is that the spring spawn is the optimum time to snag a spoonbill as they are much more active during their spawn in faster moving water. So if the current is moving pretty good and you’ve got a big spoonie on the other end, you are going to be in for a fight! Just remember, the more your hook is steadily moving through the water, the higher your chances of snagging a paddlefish. Others find more success by trolling. This is especially true early in the season as the Grand Lake gets colder…starting in December and through the beginning of the spawn in late February. This is what all of your spoonbill guides on Grand Lake will do and is another great way to snag a big ol’ fish. The key to trolling these days is having really good sonar equipment so you can see exactly where the fish are stacked up. Here is an awesome video from Outdoor Brandz and Spoonbill King showing some of tips and tricks for snagging spoonbill. If you are coming very far, you’ll want to at least spend one night in the area. During the active paddlefish months, Miami is a popular place to stay, with many hotels and casinos in the immediate area. Visit the Miami Convention and Visitors Bureau at http://www.visitmiamiok.com to find the best option for you. And if you are more interested in a resort property at Grand Lake there are many to choose from and they are all more than happy to have visitors year round. You can find places to stay at Grand Lake here. That should give you the info you need to make plans to visit Grand Lake and snag yourself a legendary Grand Lake paddlefish! PreviousThere is Going to Be a Shootout – Grand Lake Style! I live in KS. Thinking bout coming down for spoones next week. Can you give me some idea where on grand lake I should look for them at? I’m sure not the guy to ask. We have several fishing guides on here who might be able to give you some advice, although I’m sure they would rather take you on a trip! You might reach out to the Paddlefish Research Center. They can be reached at (918) 542-9422.